As part of its campaign to take out Senate President Mike Miller, SEIU Local 500 has released this video slamming him for accepting campaign contributions from the NRA. 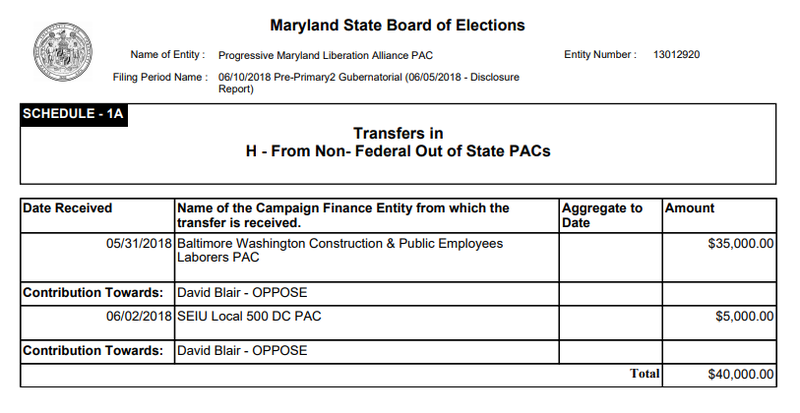 Four labor unions and an immigrant advocacy organization have contributed a combined $90,000 to a Super PAC which opposes the election of David Blair as Montgomery County Executive. 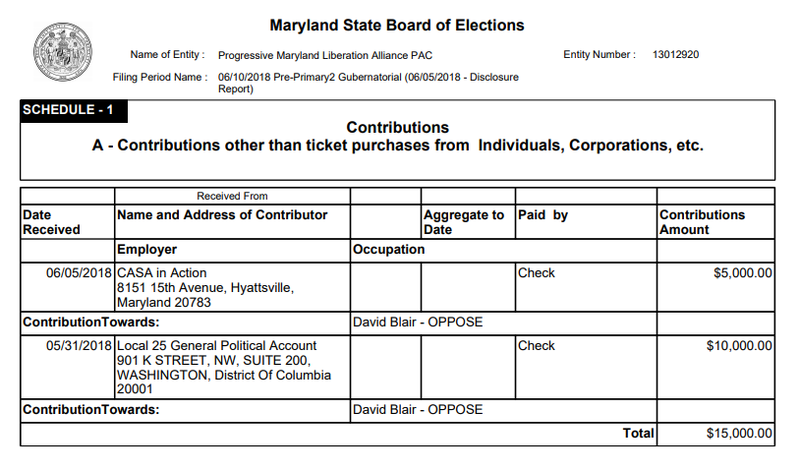 The Progressive Maryland Liberation Alliance PAC is a Super PAC affiliated with Progressive Maryland. The Super PAC’s Chair, Larry Stafford, is Progressive Maryland’s Executive Director. The group has previously distributed anti-Blair flyers but now has the money to do a lot more than that. 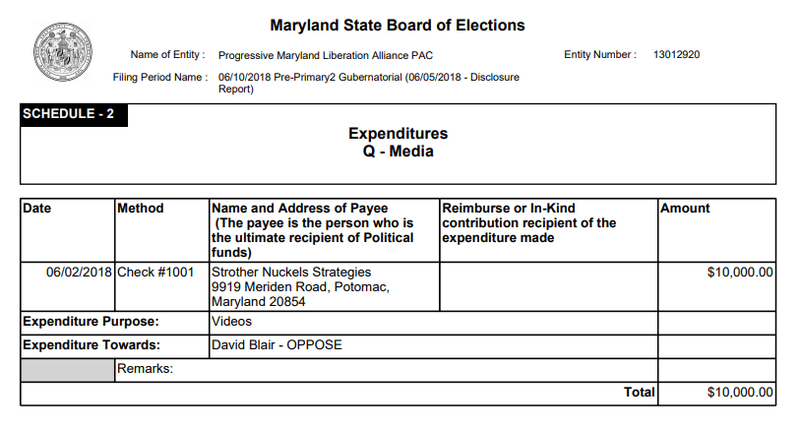 The Super PAC’s campaign finance filings indicate that it was organized for the purpose of supporting gubernatorial candidate Ben Jealous, State Senate candidates Jill Carter, Antonio Hayes and Mary Washington, State’s Attorney candidate Victor Ramirez and Delegate candidate Melissa Wells and opposing State Senator Bobby Zirkin, State’s Attorney candidate Ivan Bates and Blair. But the labor contributions to the Super PAC were explicitly designated to opposing Blair. Those contributions included $35,000 from MCGEO, $35,000 from the Laborers, $10,000 from UNITE HERE Local 25, $5,000 from SEIU Local 500 and $5,000 from immigrant advocacy group Casa in Action. All of these organizations except for UNITE HERE Local 25 have endorsed Marc Elrich for Executive, as has Progressive Maryland. Of these contributions, $10,000 has been spent on a video opposing Blair. We imagine MoCo voters will be seeing that video soon. With $80,000 remaining, the Super PAC has enough money to finance mailers and more. What’s unclear is how much more money it can raise with labor spending almost a million dollars to elect Ben Jealous as Governor and more than $600,000 to elect Donna Edwards as Prince George’s County Executive. Still, they are playing in MoCo and we expect them to play hard. As part of its campaign against Senate President Mike Miller, SEIU Local 500 has endorsed eleven State Senate candidates whom it believes will “change the leadership in the State Senate and, most importantly, change the way things are done in the legislature.” One of the candidates is Tommi Makila, Miller’s primary election opponent. The union has previously announced its support for some of these candidates, like Dana Beyer in District 18 and its own member, Aletheia McCaskill, in District 44. We reprint the union’s press release below. (Gaithersburg, MD) Today, Service Employees International Union Local 500 announces it has selected its initial eleven candidates across the State of Maryland whom they believe will go to Annapolis and change the leadership in the State Senate and, most importantly, change the way things are done in the legislature. 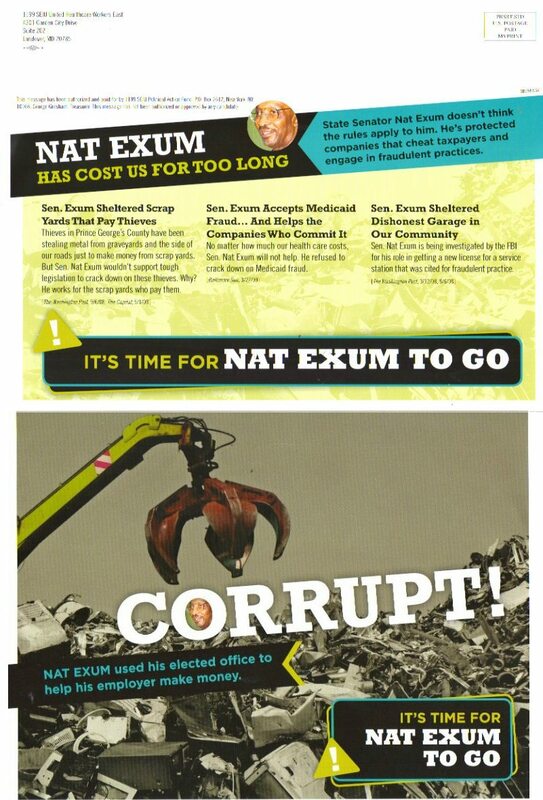 “We need to elect people who will stand up against the status quo in the State Senate. That is why, today we are announcing our support for a team of Senate candidates who will do what it takes to get the people’s business done” said Merle Cuttitta, President of SEIU Local 500. “We will be supporting this team of candidates with our trademark boots on the ground, digital, paid mail and earned media. We intend to send the message loud and clear that a vote for these candidates is a vote for progress in Annapolis,” added President Cuttitta. 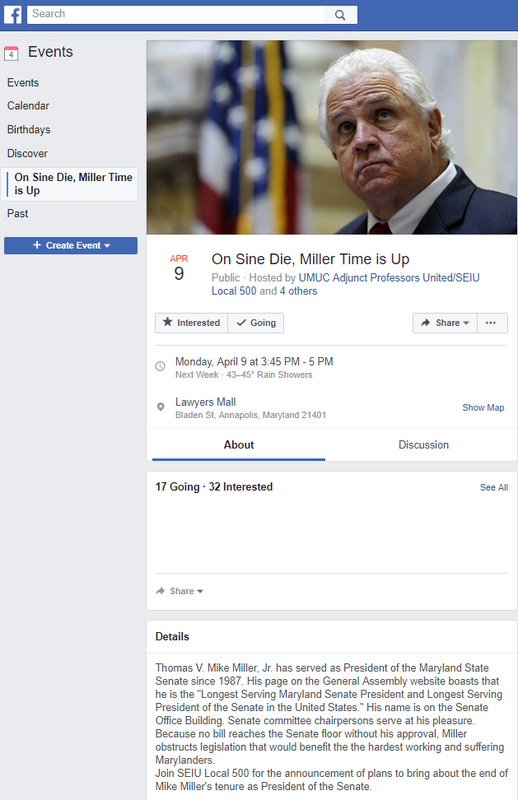 SEIU Local 500 launched its anti-Mike Miller campaign on Lawyers Mall in Annapolis today. Attending the rally in addition to SEIU members were former Delegate Jill Carter, who is running for Senate in the district of the recently resigned Nathaniel Oaks; Sheldon Laskin, who is running for Senate against incumbent Bobby Zirkin; Mila Johns, who is running for Delegate in District 18; and of course Miller’s mortal enemy, Comptroller Peter Franchot. Daily Record reporter Bryan Sears streamed video of the event on Facebook. 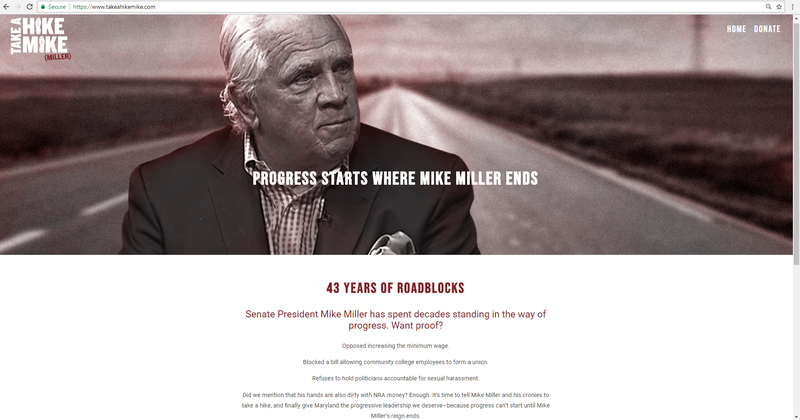 The union announced the launch of a new anti-Miller super PAC and a “Take a Hike Mike” website which we screen shot below. SEIU Local 500, one of the largest unions in Maryland, will be endorsing five candidates in MoCo races soon. The local’s membership of more than 8,000 is concentrated among MCPS support staff, adjunct college faculty and child care workers. It has one of the most aggressive political operations in the state and its endorsement is highly valued in MoCo. The union has not decided on an endorsement yet in Council District 1 and may announce one later. It has postponed endorsement decisions for incumbent Council Members outside District 3 pending further actions of the council. Since MCPS accounts for a significant portion of the local’s membership, budget decisions on the schools may impact the union’s thinking. Congratulations to the endorsees. To be continued! 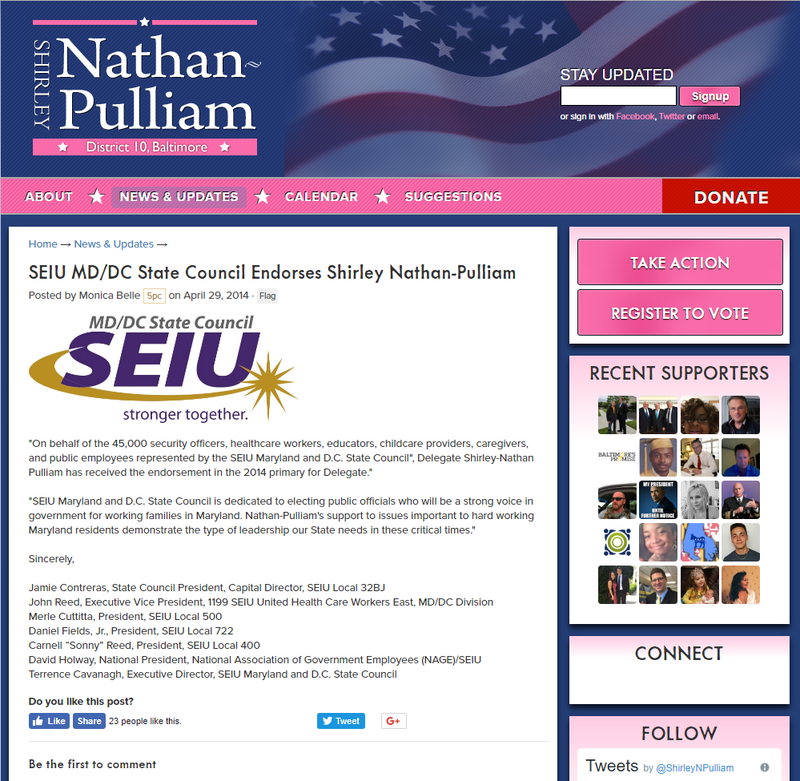 SEIU Local 500, perhaps the fastest-growing large union in Maryland, has endorsed Senate candidate Dana Beyer and House candidates Emily Shetty and Mila Johns in District 18 and House candidate Gabe Acevero in District 39. But the bigger news is their warning to state-level incumbents: we will not endorse any of you until after the legislative session. It’s a ballsy move designed to maximize their leverage over significant bills. Incumbents beware! (Gaithersburg, MD) SEIU Local 500, the largest Union local in Montgomery County today announced it was throwing its weight behind Dana Beyer for the Maryland Senate in District 18. SEIU Local 500 is not endorsing ANY incumbents running for re-election to their current offices until after the end of the legislative session.